Dutch Comic Con day 2, on this lovely Sunday morning we decided to attend Doug Jones' Q&A. It wasn't superbusy yet at Dutch Comic Con, so we found a nice spot to sit. 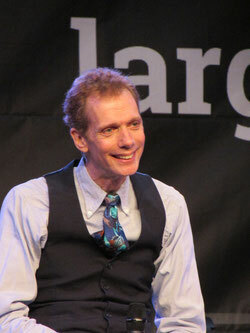 Doug Jones appeared on stage with a huge smile on his face. He started off different from the other actors. Not by directly answering questions, but by 'introducing' himself. He started to talk about projects he worked on and films he played a role in. And the audience filled in where he 'forgot'. It was a really nice start of a Q&A. We were already getting so much information and insights. It was lovely to hear. He's been in "Arrow", "The Flash", "Sons of Anarchy", "Teen Wolf", "Pan's Labyrinth", "Buffy the Vampire Slayer", "Fantastic Four: Rise of the Silver Surfer", "Crimson Peak", "Raze" etc. He has been acting for 30 years now, so his list is pretty impressive I mostly knew him from "Pan's Labyrinth" (great movie). Although he is unrecognizable in this and a lot of his other roles. "Pan's Labyrinth" is directed by Guillermo del Toro and if you've ever seen one of his movies, you'll know he is the master of visual beauty. Doug stars as the Faun, but he also plays "The Pale Man". This is one of his multiple collaborations with Del Toro. Just last year he played the role of Lady Sharpe in Crimson Peak for example.Edit: recently he also played the "monster" in the award winning " The Shape of Water". After that, it was time for questions! Doug Jones seemed an energetic, postive guy to me. He looked really enthousiastic and was very dynamic. Really enjoyable to watch. You could see he does a lot of "body-acting"(is that a word?). His movements are very gracious and his facial expressions are great. He really interacted with the people that asked questions. For example: he told a girl that he loved her ("Crimson Peak") outfit: "Thanks for dressing up today. You look great." Doug talked a lot about his work and the characters he has played. What it's like to play with all this heavy make-up, but also how it feels to play without the make -up: with your 'naked' face. I also never considered how hard it must be to eat something when you're totally dressed up al day! The hardest role he ever did was the one of the Faun on Pan's Labyrinth. It was a physical challenge (the make-up proces took 5 hours), but he also needed to do Spanish dialogs while he doesn't speak Spanish. Then we learned that Doug loves to watch romantic comedies. Because it's something else than what he plays in. His favourite movie is "Somewhere in Time" (1980, with Christopher Reeve and Jane Seymour). It involves time travelling. A man starts looking for a woman he saw on a photograph. Doug was very polite, always saying "Thank you for asking" and it really made you feel free to ask anything. He even did his "Pale Man" performance, that was great to see! He ended his Q&A by saying: "Come see me at my table, we'll hug and stuff". That wasn't just big talk, I saw him hug and greet people all day. He is incredibly nice to his fans. 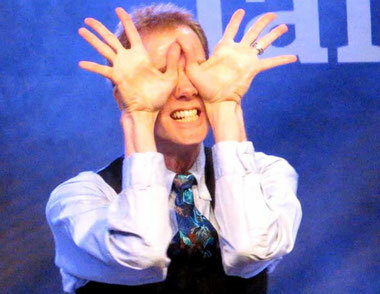 I didn't know Doug Jones very well when I went to see the Q&A, but it surprised me in a great way. I saw a kind, energetic & spontaneous actor. Showing fun in answering questions and being around his fans. What more can you wish for? Same here I knew Doug played in a lot of movies and I knew he was in "Pan's Labyrinth" and "Hellboy", but that was about all I knew. In my opnion his Q&A was the most enjoyable one to watch. I laughed out loud more than once. I didn't get the chance to go and meet him at the table and that's a real shame. I really hope to see him again on a convention in the near future.